We investigate the surface elevation change of Bhutanese glaciers during 2004–2011 using repeat GPS surveys and satellite based observations. The thinning rate of lake-terminating Lugge Glacier is > 3 times that of the land-terminating Thorthormi Glacier. Numerical simulations of ice dynamics and surface mass balance (SMB) demonstrate that the rapid thinning of Lugge Glacier is driven by negative SMB, while the thinning of Thorthormi Glacier is suppressed by dynamically induced ice thickening. Digital glacier inventories are invaluable data sets for revealing the characteristics of glacier distribution. However, quantitative comparison of present inventories was not performed. Here, we present a new inventory manually delineated from Advanced Land Observing Satellite (ALOS) imagery and compare it with existing inventories for the Bhutan Himalaya. Quantification of overlapping among available glacier outlines suggests consistency and recent improvement of their delineation quality. Among meteorological elements, precipitation has a large spatial variability and less observation, particularly in high-mountain Asia, although precipitation in mountains is an important parameter for hydrological circulation. Based on the GAMDAM glacier inventory, we estimated precipitation contributing to glacier mass at the median elevation of glaciers, which is presumed to be at equilibrium-line altitude, by tuning adjustment parameters of precipitation. The Glacier Area Mapping for Discharge from the Asian Mountains (GAMDAM) glacier inventory was updated to revise the underestimated glacier area in the first version. The total number and area of glaciers are 134,770 and 100,693±15,103 km2 from 453 Landsat images, which were carefully selected for the period from 1990 to 2010, to avoid mountain shadow, cloud cover, and seasonal snow cover. We present a high-resolution regional climate model called NHM–SMAP applied to the Greenland Ice Sheet (GrIS). The model forced by JRA-55 reanalysis is evaluated using in situ data from automated weather stations, stake measurements, and ice core obtained from 2011 to 2014. By utilizing the model, we highlight that the choice of calculation schemes for vertical water movement in snow and firn has an effect of up to 200 Gt/year in the yearly accumulated GrIS-wide surface mass balance estimates. This study presents the geodetic mass balance of Kanchenjunga Glacier, a heavily debris-covered glacier in the easternmost Nepal Himalaya, between 1975 and 2010 using high-resolution DEMs. The rate of elevation change positively correlates with elevation and glacier velocity, and significant surface lowering is observed at supraglacial ponds. A difference in pond density would strongly affect the different geodetic mass balances of the Kanchenjunga and Khumbu glaciers. For a better understanding of the stable water isotope data from ice cores, recent time periods have to be analysed, where both measurements and model simulations are available. This was done for Dome Fuji by combining observations, synoptic analysis, back trajectories, and isotopic modelling. It was found that a more northerly moisture source does not necessarily mean a larger temperature difference between source area and deposition site and thus precipitation more depleted in heavy isotopes. 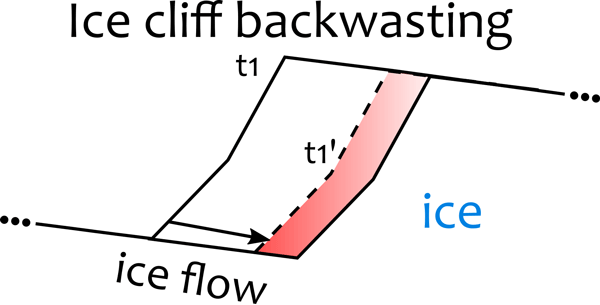 On debris-covered glaciers, steep ice cliffs experience dramatically enhanced melt compared with the surrounding debris-covered ice. Using field measurements, UAV data and submetre satellite imagery, we estimate the cliff contribution to 2 years of ablation on a debris-covered tongue in Nepal, carefully taking into account ice dynamics. While they occupy only 7 to 8 % of the tongue surface, ice cliffs contributed to 23 to 24 % of the total tongue ablation. This paper presents a new perspective on the role of ice dynamics and ocean interaction in glacier calving processes applied to Kronebreen, a tidewater glacier in Svalbard. A global modelling approach includes ice flow modelling, undercutting estimation by a combination of glacier energy balance and plume modelling as well as calving by a discrete particle model. We show that modelling undercutting is necessary and calving is influenced by basal friction velocity and geometry. We determine a method to locate calving at Helheim Glacier. By using local seismometers, we are able to find the calving location at a much higher precision than previous studies. The signal–onset time differences at four local seismic stations are used to determine possible seismic-wave origins. We present a catalogue of 12 calving events from 2014 to 2015, which shows that calving preferentially happens at the northern end of Helheim Glacier, which will help to constrain models of calving. The strong atmospheric warming observed since the 1990s in polar regions requires quantifying the contribution to sea level rise of glaciers and ice caps, but for large areas we do not have much information on ice dynamic fluctuations. The recent increase in satellite data opens up new possibilities to monitor ice flow. We observed over Stonebreen on Edgeøya (Svalbard) a strong increase since 2012 in ice surface velocity along with a decrease in volume and an advance in frontal extension. We used multiple digital elevation models to quantify melt on 32 glaciers in the Everest region of the Himalayas. We examined whether patterns of melt differed depending on whether the glacier terminated on land or in water. We found that glaciers terminating in large lakes had the highest melt rates, but that those terminating in small lakes had comparable melt rates to those terminating on land. We carried out this research because Himalayan people are highly dependent on glacier meltwater. We present modelled climatic mass balance for all glaciers in Svalbard for the period 1957–2014 at 1 km resolution using a coupled surface energy balance and snowpack model, thereby closing temporal and spatial gaps in direct and geodetic mass balance estimates. Supporting previous studies, our results indicate increased mass loss over the period. A detailed analysis of the involved energy fluxes reveals that increased mass loss is caused by atmospheric warming further amplified by feedbacks. This paper provides a comprehensive assessment of the state of small glaciers in the Canadian province of Labrador. These glaciers, the last in continental northeast North America, exist in heavily shaded locations within the remote Torngat Mountains National Park. Fieldwork, and airborne and spaceborne remote-sensing analyses were used to measure regional glacier area changes and individual glacier thinning rates. These results were then linked to trends in prevailing climatic conditions. Measurements of debris-covered and debris-free glaciers in the Himalaya-Karakoram show similar decadal scale thinning, despite a suppression of melt under the debris. Using physical arguments, supported by simulations of 1-D idealised glaciers, we analyse the evolution of thinning rates on both glacier types under a warming climate. The dynamics of the emergence velocity profile control the thinning rate evolution in general and lead to the observed trends in the thinning rate data. This paper evaluates the geometric force balance, with application to Byrd Glacier, Antarctica. It is concluded that this approach does not yield physically reasonable results. Geometric effects induced by tilt errors lead to erroneous measurement of snow albedo. These errors are corrected where tilts of sensors and slopes are unknown. Atmospheric parameters are taken from a nearby reference measurement or a radiation model. The developed model is fitted to the measured data to determine tilts and directions which vary daily due to changing atmospheric conditions and snow cover. The results show an obvious under- or overestimation of albedo depending on the slope direction. Ice loss from calving and surface melt is estimated at lake-terminating Bridge Glacier, British Columbia, Canada, from 1984 to 2013. Since the glacier's terminus began to float in 1991, calving has accounted for 10-25% of the glacier's total ice loss below the ELA. Overall, calving is a relatively small component of ice loss and is expected to decrease in importance in the future as the glacier retreats onto dry land. Hence, projections of future retreat remain dependent on climatic conditions. We show that estimates of global glacier mass change during the 20th century, obtained from glacier-length-based reconstructions and from a glacier model driven by gridded climate observations are now consistent with each other and also with an estimate for the years 2003-2009 that is mostly based on remotely sensed data. This consistency is found throughout the entire common periods of the respective data sets. Inconsistencies of reconstructions and observations persist on regional scales. Kronebreen and Kongsbreen are among the fastest flowing glaciers on Svalbard, and surface speeds reached up to 3.2m d-1 at Kronebreen in summer 2013 and 2.7m d-1 at Kongsbreen in late autumn 2012 as retrieved from SAR satellite data. Both glaciers retreated significantly during the observation period, Kongsbreen up to 1800m or 2.5km2 and Kronebreen up to 850m or 2.8km2. Both glaciers are important contributors to the total dynamic mass loss from the Svalbard archipelago. We employ statistical models to model annual glacier mass balances of eight Scandinavian glaciers as function of summer temperature and winter precipitation. Relative importances of winter precipitation and summer temperature vary in time. Relative importances are influenced by AMO and NAO. Whereas glacier surge is known to often initiate in winter, we show significant winter speed-up signals in the upstream region even at quiescent surge-type glaciers in Yukon, Canada. Moreover, the winter speed-up region expanded from upstream to downstream. Given the absence of surface meltwater input in winter, we speculate the presence of englacial water storage that does not directly connect to the surface, yet can promote basal sliding through increased water pressure. Arendt, A., Bliss, A., Bolch, T., Cogley, J. G., Gardner, A. S., Hagen, J.-O., Hock, R., Huss, M., Kaser, G., Kienholz, C., Pfeffer, W. T., Moholdt, G., Paul, F., Radić, V., Andreassen, L., Bajracharya, S., Barrand, N., Beedle, M., Berthier, E., Bhambri, R., Brown, I., Burgess, E., Burgess, D., Cawkwell, F., Chinn, T., Copland, L., Davies, B., de Angelis, H., Dolgova, E., Filbert, K., Forester, R., Fountain, A., Frey, H., Giffen, B., Glasser, N., Gurney, S., Hagg, W., Hall, D., Haritashya, U., Hartmann, G., Helm, C., Herreid, S., Howat, I., Kapustin, G., Khromova, T., König, M., Kohler, J., Kriegel, D., Kutuzov, S., Lavrentiev, I., LeBris, R., Lund, J., Manley, W., Mayer, C., Miles, E., Li, X., Menounos, B., Mercer, A., Mölg, N., Mool, P., Nosenko, G., Negrete, A., Nuth, C., Pettersson, R., Racoviteanu, A., Ranzi, R., Rastner, P., Rau, F., Raup, B., Rich, J., Rott, H., Schneider, C., Seliverstov, Y., Sharp, M., Sigur\dhsson, O., Stokes, C., Wheate, R., Winsvold, S., Wolken, G., Wyatt, F., and Zheltyhina, N.: Randolph Glacier Inventory – A Dataset of Global Glacier Outlines: Version 4.0, Global Land Ice Measurements from Space, National Snow and Ice Data Center, Boulder, USA, 2014. Bajracharya, S. R. and Shrestha, B. (Eds. ): The status of glaciers in the Hindu Kush–Himalayan region, International Centre for Integrated Mountain Development, Kathmandu, Nepal, 2011. 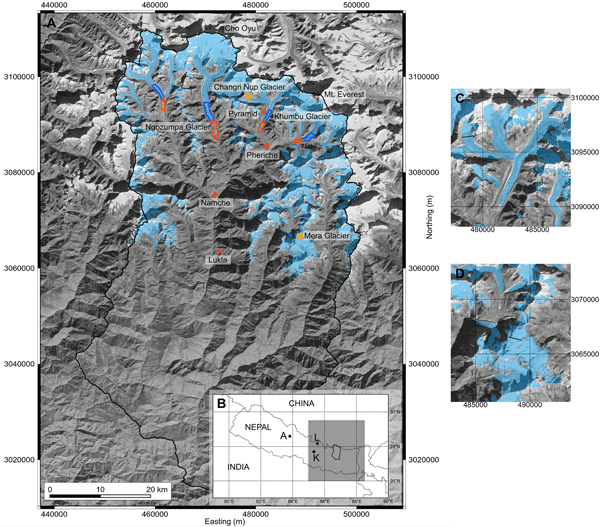 Bhambri, R., Bolch, T., and Chaujar, R.: Mapping of debris-covered glaciers in the Garhwal Himalayas using ASTER DEMs and thermal data, Int. J. Remote Sens., 32, 8095–8119, 2011. Bolch, T., Pieczonka, T., and Benn, D. I.: Multi-decadal mass loss of glaciers in the Everest area (Nepal Himalaya) derived from stereo imagery, The Cryosphere, 5, 349–358, https://doi.org/10.5194/tc-5-349-2011, 2011. Bolch, T., Kulkarni, A. Kääb, A., Huggel, C., Paul, F., Cogley, J. G., Frey, H., Kargel, J. S., Fujita, K., Scheel, M., Bajracharya, S., and Stoffel, M.: The state and fate of Himalayan Glaciers, Science, 336, 310–314, 2012. Cogley, J. G.: Climate Science: Himalayan glaciers in the balance, Nature, 488, 468–469, https://doi.org/10.1038/488468a, 2012. Ding, Y., Liu, S., Li, J., and Shangguan, D.: The retreat of glaciers in response to recent climate warming in western China, Ann. Glaciol., 43, 97–105, 2006. Frey, H., Paul, F., and Strozzi, T.: Compilation of a glacier inventory for the western Himalayas from satellite data: methods, challenges, and results, Remote Sens. Environ., 124, 832–843, https://doi.org/10.1016/j.rse.2012.06.020, 2012. Fujita, K. and Nuimura, T.: Spatially heterogeneous wastage of Himalayan glaciers, P. Natl. Acad. Sci. USA, 108, 14011–14014, 2011. Gardelle, J., Berthier, E., Arnaud, Y., and Kääb, A.: Region-wide glacier mass balances over the Pamir-Karakoram-Himalaya during 1999–2011, The Cryosphere, 7, 1263–1286, https://doi.org/10.5194/tc-7-1263-2013, 2013. Gardner, A., Moholdt, G., Cogley, J., Wouters, B., Arendt, A., Wahr, J., Berthier, E., Hock, R., Pfeffer, W., Kaser, G., Ligtenberg, S., Bolch, T., Sharp, M., Hagen, J., van den Broeke, M., and Paul, F.: A reconciled estimate of glacier contributions to sea level rise: 2003 to 2009, Science, 340, 852–857, https://doi.org/10.1126/science.1234532, 2013. Hayakawa, Y., Oguchi, T., and Lin, Z.: Comparison of new and existing global digital elevation models: ASTER G-DEM and SRTM-3, Geophys. Res. Lett., 35, L17404, https://doi.org/10.1029/2008GL035036, 2008. He, Y.: Changing features of the climate and glaciers in China's monsoonal temperate glacier region, J. Geophys. Res., 108, 1–7, https://doi.org/10.1029/2002JD003365, 2003. 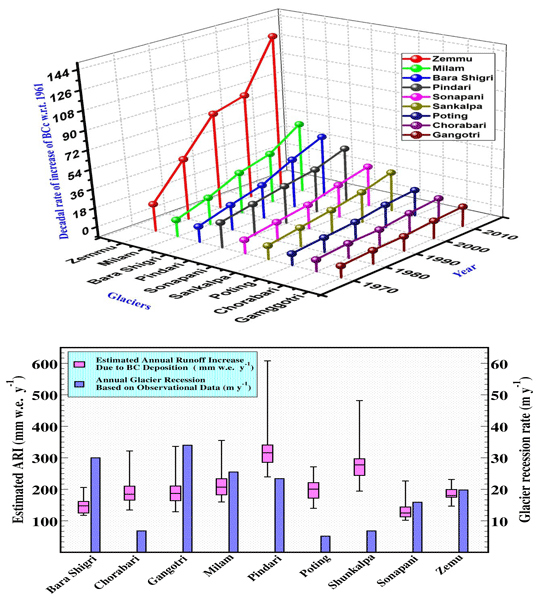 Immerzeel, W., van Beek, L. P. H., and Bierkens, M.: Climate change will affect the Asian water towers, Science, 328, 1382–1385, https://doi.org/10.1126/science.1183188, 2010. Jacob, T., Wahr, J., Pfeffer, W., and Swenson, S.: Recent contributions of glaciers and ice caps to sea level rise, Nature, 482, 514–518, 2012. Jarvis, A., Reuter, H., Nelson, A., and Guevar, E.: Hole-filled SRTM for the globe Version 4, available from the CGIAR-CSI SRTM 90 m Database, http://srtm.csi.cgiar.org/, last access: 28 March 2014. Kääb, A.: Glacier volume changes using ASTER satellite stereo and ICESat GLAS laser altimetry. A Test Study on Edgeøya, Eastern Svalbard, IEEE T. Geosci. Remote, 46, 2823–2830, 2008. Kaser, G., Grosshauser, M., and Marzeion, B.: Contribution potential of glaciers to water availability in different climate regimes, P. Natl. Acad. Sci. USA, 107, 20223–20227, 2010. Li, X., Cheng, G., Jin, H., Kang, E., Che, T., Jin, R., Wu, L., Nan, Z., Wang, J., and Shen, Y.: Cryospheric change in China, Global Planet. Change, 62, 210–218, 2008. Liu, S., Shangguan, D., Ding, Y., Han, H., Xie, C., Zhang, Y., Li, J., Wang, J., and Li, G.: Glacier changes during the past century in the Gangrigabu mountains, southeast Qinghai-Xizang (Tibetan) Plateau, China, Ann. Glaciol., 43, 187–193, https://doi.org/10.3189/172756406781812348, 2006. Matsuo, K. and Heki, K.: Time-variable ice loss in Asian high mountains from satellite gravimetry, Earth Planet. Sc. Lett., 290, 30–36, 2010. McClung, D. and Schaerer, P.: The Avalanche Handbook, 3rd Edn., The Mountaineers Books, Seattle, 342 pp., 2006. Paul, F., Huggel, C., and Kääb, A.: Combining satellite multispectral image data and a digital elevation model for mapping debris-covered glaciers, Remote Sens. Environ., 89, 510–518, 2004. Paul, F., Barrand, N., Baumann, S., Berthier, E., Bolch, T., Casey, K., Frey, H., Joshi, S., Konovalov, V., Le Bris, R., Mölg, N., Nosenko, G., Nuth, C., Pope, A., Racoviteanu, A., Rastner, P., Raup, B., Scharrer, K., Steffen, S., and Winsvold, S.: On the accuracy of glacier outlines derived from remote-sensing data, Ann. Glaciol., 54, 171–182, https://doi.org/10.3189/2013AoG63A296, 2013. Pfeffer, W. T., Arendt, A. A., Bliss, A., Bolch, T., Cogley, J. G., Gardner, A. S., Hagen, J. O., Hock, R., Kaser, G., Kienholz, C., Miles, E. S., Moholdt, G., Mölg, N., Paul, F., Radić, V., Rastner, P., Raup, B. H., Rich, J., Sharp, M. J., and the Randolph Consortium: The Randolph Glacier Inventory: a globally complete inventory of glaciers, J. Glaciol., 60, 537–552, 2014. Racoviteanu, A., Paul, F., Raup, B., Khalsa, S., and Armstrong, R.: Challenges and recommendations in mapping of glacier parameters from space: results of the 2008 Global Land Ice Measurements from Space (GLIMS) workshop, Boulder, Colorado, USA, Ann. Glaciol., 50, 53–69, https://doi.org/10.3189/172756410790595804, 2009. Raper, S. C. B. and Braithwaite, R.: The potential for sea level rise: New estimates from glacier and ice cap area and volume distributions, Geophys. Res. Lett., 32, L05502, https://doi.org/10.1029/2004GL021981, 2005. Rastner, P., Bolch, T., Mölg, N., Machguth, H., Le Bris, R., and Paul, F.: The first complete inventory of the local glaciers and ice caps on Greenland, The Cryosphere, 6, 1483–1495, https://doi.org/10.5194/tc-6-1483-2012, 2012. Raup, B. and Khalsa, S.: GLIMS analysis tutorial, Boulder, CO, University of Colorado, National Snow and Ice Data Center, http://www.glims.org/MapsAndDocs/guides.html (last access: 28 January 2014), 2007. Salerno, F., Buraschi, E., Bruccoleri, G., Tartari, G., and Simiraglia, C.: Glacier surface-area changes in Sagarmatha national park, Nepal, in the second half of the 20th century, by comparison of historical maps, J. Glaciol., 54, 738–752, 2008. Shangguan, D., Liu, S., Ding, Y., Li, J., Zhang, Y., Ding, L., Wang, X., Xie, C., and Li, G.: Glacier changes in the west Kunlun Shan from 1970 to 2001 derived from Landsat TM/ETM+ and Chinese glacier inventory data, Ann. Glaciol., 46, 204–208, https://doi.org/10.3189/172756407782871693, 2007. Shi, Y. (Ed. ): Concise Glacier Inventory of China, Shanghai Popular Science Press, China, 2008. Shi, Y., Hsieh, T., Cheng, P., and Li, C.: Distribution, features and variations of glaciers in China, IAHS Publ., 126, 111–116, 1980. Thakuri, S., Salerno, F., Smiraglia, C., Bolch, T., D'Agata, C., Viviano, G., and Tartari, G.: Tracing glacier changes since the 1960s on the south slope of Mt. Everest (central Southern Himalaya) using optical satellite imagery, The Cryosphere, 8, 1297–1315, https://doi.org/10.5194/tc-8-1297-2014, 2014. Yao, X., Liu, S., Sun, M., Wei, J., and Guo, W.: Volume calculation and analysis of the changes in moraine-dammed lakes in the north Himalaya: a case study of Longbasaba lake, J. Glaciol., 58, 753–760, 2012.